A new year is right around the corner and there’s nothing more exciting than the prospect of setting a goal to go after for the next 365 days. 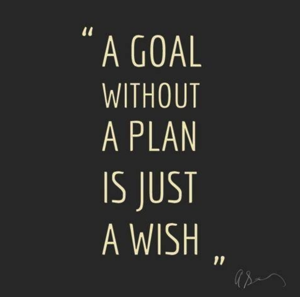 Setting 2016 goals will give your fitness program direction while also helping keep it on track throughout the year. Here are four tips to help you kick off 2016 with a bang then keep it going. Go big (and small). Setting big 2016 goals is great. Unfortunately, big goals are often intimidating and failing to reach them in a hurry can lead to disappointment and frustration. Make sure your big 2016 goal can be broken down into smaller, step-wise ones that will help you stay motivated when the going gets tough. Find a friend. Everything is more fun with a buddy! Even if you don’t have the same 2016 goals having a partner to run, lift, swim, bike or yoga with has lots of benefits. Friends provide accountability and motivation on tough days and make celebrating an accomplishment that much more exciting. Journal. Start keeping a journal of your workouts. Label it 2016 Goals and fill in each day with what you did to get closer to reaching them. Not only is a journal a great way to track progress, it’s something to look back at to see how far you’ve come when you’re feeling tired or upset after a bad day. Be sure to include lifestyle changes in your daily notes. It’s hard to train for a marathon when you’re not getting enough sleep or eating the right things. Include how much you sleep, how you feel, what you ate and other external factors in your journal to see how those factors can change your ability to perform. Lifestyle. A big factor in reach the 2016 goals you’ve set is how you support the body that getting you there. Ensure you’re getting enough sleep to recover, try cutting out most of your alcohol intake and increasing the amount of whole foods eat. Setting a routine and sticking to it can be challenging but when you cross that finish line, it’ll be worth all the hard work. This entry was posted in Nutrition and tagged goal, new year, setting goals on December 28, 2015 by meredith@fitnicept.com. Healthy holidays are hard work. Parties, treats and travel making eating right and exercising an added challenge bu Labor Day is swiftly approaching and with it come back to school, football, cross-country and a brand new series of PR opportunities. One of the best ways you can get ready for a great fall season is to stick with your healthy holidays plan over one of the biggest party weekends of the year. Here are a few ideas to help you have healthy holidays from one Labor Day to the next! Plan to exercise. Healthy holidays are easy when you find a way to fit a long walk on the beach into your day or play a few games of backyard football with family. If you’re traveling, check out a new gym or use MapMyRun to discover an awesome new running trail. Make good choices. Survey buffets, know what your choices are then step back and make good ones. Choose fresh veggies over baked beans from a can or an extra slice of sweet watermelon over a chocolate chip cookie. Bring your own! Bring your own dish to the barbecue. Healthy holidays don’t require much thinking if you’ve prepared it yourself. You know what’s in the dish, how much you can safely eat and it’s a great way to learn and share recipes with friends. Go easy on the sugar. With parties all over the place, healthy holidays can easily get derailed by too much alcohol. Full of sugar, booze can take a weekend full of good food choices right off track. Two sugary glasses of wine, a few empty carb filled beers or even indulging in a mixed drink full of soda can quickly add many unwanted calories to your day. Take these tips to your next Labor Day bash and you’ll be guaranteed to have healthy holidays for years to come. This entry was posted in Nutrition, Wellness and tagged healthy eating, healthy holidays, holiday eating on August 31, 2015 by meredith@fitnicept.com. Tin foil chicken and vegetables is a fantastic week night meal. This recipe is quick, simple, good for you and delicious. It’s easy to mix up the dish’s flavors by simply switching out one or two ingredients. Using the ingredients below, each serving is home to less than 300 calories, packed with muscle building protein and very filling. Serve by carefully opening foil packets and pouring chicken, vegetables and juice onto a plate. This simple chicken and vegetables recipe can be switched up for winter by adding squash and carrots or swapping out taco flavors for basil and thyme. You can see how the calorie count would change when plug in your choice of ingredients in here. Use fresh vegetables for a colorful and delicious meal that’s great all year long, very easy to cleanup and won’t take away from family time. 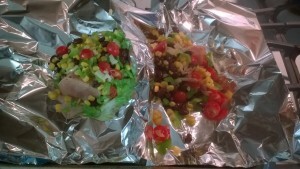 Give this tin foil chicken and vegetables recipe a try. This entry was posted in Nutrition, Recipes and tagged 30 minute meal, chicken recipes, dinner recipes, nutrition, recipes on June 29, 2015 by meredith@fitnicept.com. Compression socks are a key element of every successful runner’s wardrobe. A pair of graduated compression socks, which are tightest at the ankle and gradually lessens to have less pressure at the top of the calf, is an inexpensive way to keep your muscles filled with nutrients, prevent fatigue and speed recovery. You can also try compression pants, shorts, back braces and arm sleeves for all of your muscle groups but it’s easiest to start small which means socks are the best route. Here are the reasons you’ll want to head out and grab a pair today. 1. Compression socks and sleeves provide additional support to muscles and limit movement which will lessen fatigue and improve performance. Compression will also help clear the lactic acid that results from a hard session clear out of working muscles. This increase in lactate threshold can ultimately lead to improved performance. 2. Compression socks will alleviate swelling and inflammation without changing the body’s response. Unlike ice, compression doesn’t mute the body’s response to muscle damage but encourages it to work. 3. The pressure of compression socks will help deoxygenated blood travel back to your heart faster. Muscles are then filled with blood rich in the oxygen and nutrients needed to help them repair at a faster rate. 4. Ever fly? Compression socks or sleeves are a must, especially after a race. They’ll help keep blood circulating to damaged muscles, legs fresh and your whole body hydrated. Now that you know slipping on a pair of compression socks can help your body get better faster, head to your local running store or buy some online. There are a number of brands in a variety of price ranges that offer every color or pattern you could want to match each pair of your workout shorts so finding what you like best can be something fun. My favorites include BioSKin Calf Skins for workouts and CEP Compression Socks for travel. Start wearing them after every workout and any time you flight to see just how much your recovery rate can improve. This entry was posted in Nutrition and tagged compression, compression socks, recovery on June 22, 2015 by meredith@fitnicept.com. We all know maintaining a healthy diet can be hard. Fad diets might look great but they’re almost always a bad idea. More important than jumping on the latest bandwagon are getting plenty of the right ingredients, enough sleep and lots of exercise. Luckily, there are four simple changes you can make to your meal plan to help you perform better, feel better and recover faster. Cut calories by up to 40%. A healthy diet isn’t one that stuffs you at every meal. Eating until you’re full and saving the rest for later might mean eating a little more slowly so you can feel when you’re full before over indulging. Decreasing caloric intake has benefits such as extending life, delaying onset of numerous diseases, enhancing performance and allowing your body to reach its optimal weight. Read your food labels, stick with lots of fresh fruits and veggies, dine on lean cuts of meat and get plenty of fiber to help you fill up without racking up the calories. Get lots of antioxidants. Antioxidants are the human body’s cleaning lady. Free radicals create all kinds of mayhem by attacking healthy cells in your body and can cause premature aging, diabetes, and cancer. Antioxidants work to counteract and neutralize these free radicals, so having plenty of them in your body helps keep you looking young and disease free. Even better news is that all of these antioxidants come from the brightly colored vegetables that are a big part of your healthy diet. Five servings a day of foods like almonds, broccoli, tomatoes, pinto beans, berries, carrots and pineapple will keep your snacking, and free radical fighting antioxidant, supply fresh. Eat foods that have a low glycemic response. The glycemic index (GI) measures how the carbohydrates in a given food change blood sugar levels. High GI foods are quickly digested and cause spikes in blood sugar levels while low GI foods digest slowly. Slowly digested carbohydrates help maintain healthy blood sugar levels and aid in weight loss by controlling hunger. A healthy diet leaves out high GI foods like white bread, white rice, and sugary drinks, includes a few medium GI foods include whole wheat bread, sweet potatoes and corn tortillas and loads up on low GI fruits, vegetables, intact nuts and legumes. Eat healthy fats. A healthy diet is home to good-for-you fats and kicks the bad, saturated and trans-fats to the curb. Eating lots of bad fats, which are usually solid at room temperature, has been proven to increase levels of bad cholesterol and your risk of disease. Healthy omega-3 fatty acids and mono- and poly-unsaturated fats are usually liquid at room temperature and protect the heart while benefiting overall health. Bad fats are found in butter, cheese, fatty cuts of meat, commercially packaged cakes and pizza doughs, candy bars and margarine. Healthy fats are in olive oil, nuts, fatty fish, peanut oil, and avocados. Omega-3s are a special type of fat best gotten from fish that have been proven to benefit heart and brain health, reduce symptoms of depression, support healthy pregnancies, ease joint pain, decrease the risk of heart disease, stroke and cancer and protect against memory loss. Take these tips to the grocery store on your next trip and start working on a healthy diet today. Your body will thank you by being healthier, happier and performing both mentally and physically at a higher level. This entry was posted in Fitness, Nutrition, Wellness and tagged fitness, healthy diet, healthy eating, nutrition on April 27, 2015 by meredith@fitnicept.com. Will run for beer. Will run for wine. These little phrases grace hats, headbands, and stickers near race courses every weekend. It’s a great premise, running to burn the calories you know you’ll be enjoying after your workout. Unfortunately, alcohol does more than simply replace your now missing calories. Dehydration. We all know that hydration is an important part of being able to perform at peak levels. Alcohol acts as a diuretic, each gram of alcohol we consume generates 10 milliliters of urine. This can equate to lots of bathroom trips and serious dehydration. Muscles are 75% water and leaving them thirsty can result in fatigue, weakness and electrolyte imbalances with as little as 2% dehydration having an impact on your athletic performance. Muscle Performance. Not only will thirsty muscles not be able to perform at their peak, they won’t get any stronger. In addition to dehydration and electrolyte imbalances, alcohol can reduce the protein synthesis required for muscle building through a steroid hormone called Cortisol. Cortisol is released in response to low blood glucose levels that results from indulging in alcohol and works in opposition to the systems that build muscle. Cortisol can even tear proteins apart, resulting in muscle atrophy and making you weaker instead of stronger. Sleep. ‘Passing out’ is not the restorative sleep any body needs, especially those looking to be active the next day. While one or two beverages might help relieve stress and make hitting the way a bit easier, alcohol does interrupt your sleep patterns. To feel like we get a good night’s sleep, we have to enter REM sleep, which alcohol prevents. Poor REM sleep can lead to tiredness during the day, an inability to concentrate and an overall crummy mood. Weight gain. Most of us know all of the empty calories associated with alcohol can lead to weight gain. What we need to know is how. Ethanol (alcohol), like a carbohydrate, is processed by the human body as sugar. When we load the body up with processed foods or booze, blood sugar levels spike, insulin resistance decreases and everything the body can’t immediately process is stored as fat. To learn more, check out this video from P360 in San Diego. Hangovers. Not only will have a headache after a night of boozing, your coordination, reaction times and balance will all be suffering, too. You’ll also be less motivated to actually get out there and exercise while simultaneously inclined to eat something greasy and unhealthy. There’s nothing wrong with having a fun and enjoying a few cocktails, it’s a great way to celebrate setting a new PR or finishing your first marathon. Make sure you don’t end up steering clear of your recovery workout the next morning, by including water in your drinking plan, having food with your fun and stopping alcohol consumption long before bedtime. This entry was posted in Fitness, Nutrition, Running, Wellness and tagged alcohol and performance, alcohol and weight gain, effects of alcohol on running, fitness, running, weight gain, weight loss on April 6, 2015 by meredith@fitnicept.com. Here’s a great weeknight recipe that’s rich in protein and simple to put together. Team FitNice loves this shrimp and broccoli stir fry that can be sweetened with teriyaki or toughened up a bit with soy. This recipe uses a few of my favorite veggies but choosing your own favorite vegetables mean it’s sure to make everyone around your table happy. 1. Mix water, teriyaki, vinegar, cornstarch and sugar in bowl and set to side. 2. In wok, heat oil and stir in garlic for 20 seconds. Add pepper, carrot, broccoli and onion. Stir for 3 minutes or until vegetables are cooked to preference. Once vegetables are cooked, remove from wok with slotted spoon and set aside. 3. Add teriyaki mix to wok. Heat and stir gently until thick and bubbly. Add shrimp and cook 3 minutes or until shrimp is opaque. Stir in vegetables and heat through. Be sure to use a low sodium teriyaki or soy to keep this shrimp and broccoli stir fry recipe heart healthy and enjoy it for year to come! This entry was posted in Nutrition, Recipes and tagged recipe, recipes, seafood, seafood recipe, shrimp, stir fry, weeknight meals on January 19, 2015 by meredith@fitnicept.com. Thanksgiving is right around the corner and there are plenty more holidays right on the heels of that. Maintaining your fitness routine and healthy eating habits can certainly be challenging at this time of year with parties, treats and wine at every turn. No matter what your plans are before you ring in the new year, here are six tips from Team FitNice to help you stay healthy over the holidays. 1. Carry and use disinfecting wipes or a hand sanitizer if you’re going to be touching things like railings, restroom doors, airplane tray tables, elevator buttons and shopping carts. Germs can spread easily during the holidays and keeping your hands clean is one of the best ways to avoid catching a cold. 2. Pack healthy snacks and bring a healthy dish. Having a granola bar handy and bringing a crudities tray rather than a cookie platter will help not only you but the party’s other guests maintain a healthy diet during these challenging months. 3. Make a plan. Schedule time to work out, especially if you have family in town or are going to see some. A flag football game is a great way to get everyone moving and a brisk morning walk is the perfect time for a warm mug of coffee and some quality time with loved ones. If you’re lucky, you might even be able to find a nearby 5k or ugly sweater run for a little friendly family competition. 4. Add fitness to holiday activities. Do ten squats for every present wrapped, five push-ups when the bow is on and two burpees when it’s all ready to go. Combining workouts and chores makes both go by a little bit faster without making you feel like you’re losing any time. 5. Steer clear of lots of alcohol. Alternate alcoholic beverages with glasses water and take it easy on all of those empty carb calories. You’ll want to be entertained, not the entertainment. Plus, a hangover won’t only keep you from feeling good enough to hit the gym the next morning, it’ll make you crave greasy, bad for you foods while dehydration makes you more susceptible to germs. 6. Don’t stress. Just because you’ve made a plan, tried to eat the right things and imbibed in moderation doesn’t mean everything goes right. If you step off track, it’s OK. Stress leads to poor decision making that can make everything worse and missing one workout isn’t the end of your chance to stay healthy over the holidays. Use any or all of these tips to stay healthy over the holidays and start your new year off on the right foot. This entry was posted in Fitness, Nutrition, Wellness and tagged healthy eating, healthy holidays, holiday health, tips on November 24, 2014 by meredith@fitnicept.com.